21st February 2002 Added this Page for Meetings held in 2000. The December, 2000 Meeting was a visit by the President of the RSGB, Don Beattie, G3OZF. Don's talk was "The Past, the Present and the Future of the RSGB". Don saw the Radio Amateur as a changing person as Society has changed over the past few years. The introduction of the Internet means that to communicate with foreign lands one no longer needs an Amateur radio set and a Licence. Don saw the future where the Amateur had a challenge - to communicate with skill and to enjoy friendship with other Amateurs. See the write-up and photographs in the February 2001 RadCom, page 9. 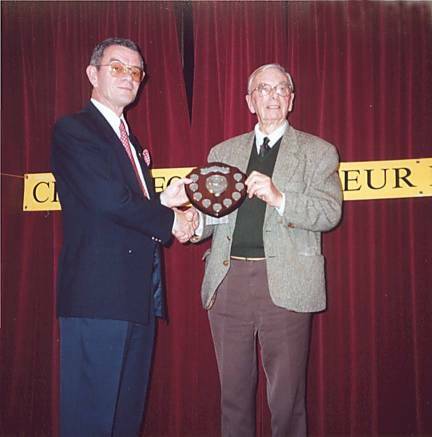 Don Beattie being handed the G5RV Memorial Shield by Harry, G5HF, President of CARS. The G5RV Memorial Shield is presented to the RSGB to be given yearly to the winner of a Contest which has a high proportion of contestants who are new to the Hobby. G5RV was one of the founding Members of CARS. Don was also presented with a Gavel, made by woodturning craftsman Ralph, G3NAA, and an Associated Membership Certificate to CARS.